The Australian continent harbors some of the most unique and amazing animal species in the world. The deadly crocodile roams its waterways; the calm koala lazes in its trees; and the kangaroo hops effortlessly across the Outback. The Silver Australian Kangaroo is an all-new silver bullion series from the Perth Mint. 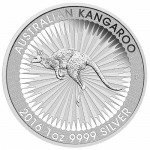 Right now, the 2016 Silver Australian Kangaroo is available on Silver.com in perfect condition. First coin in the Silver Australian Kangaroo series! Features the red kangaroo on the reverse design. Kangaroos are an extremely unique species. Part of the marsupial family, like its smaller cousin the koala, the kangaroo is one of the only animals in the world incapable of moving backwards fluidly. The large hind legs and long, muscular tail of the species provides balance and speed while hopping, but makes it difficult to maneuver backwards. 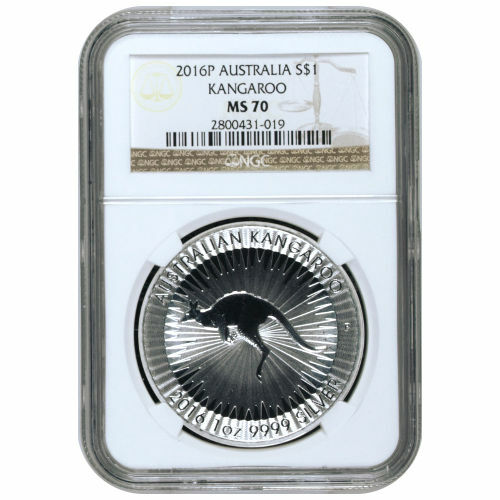 Each 2016 1 oz Silver Australian Kangaroo offered on Silver.com right now is in perfect condition according to the NGC. 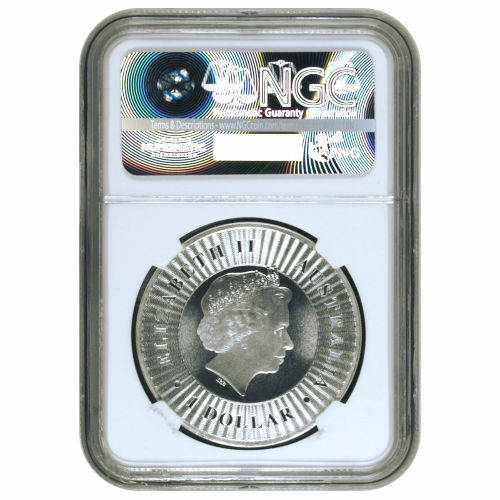 Coins with an MS70 grade have their full, original mint luster and bear no detracting flaws of any kind. Previously used on other kangaroo-themed coins, the reverse of the Silver Australian Kangaroo features a depiction of the red kangaroo subspecies created by Dr. Stuart Devlin. The animal is depicted hopping in the design with bright rays of sunshine permeating the background field. On the obverse is the image of Queen Elizabeth II, a staple of commonwealth coin design from Canada to the UK, and Australia. Her Majesty’s right-profile portrait was created in 1998 by Ian Rank-Broadley. Australia’s Perth Mint is the oldest operating facility in the country. Opened in 1898 as the third and final facility for the British Royal Mint, it was eventually transferred to Australian control in the 1970s when the British ceded the mint to the state government of Western Australia. Today it operates separately of the Royal Australian Mint, but its products are still legal tender under the Currency Act of 1965. If you have questions, please reach out to Silver.com at 888-989-7223, connect with us online using our live chat, or email us.